Sugar beet is a root vegetable generally used to produce sugar. Being rich in nutrients and low in fat and calories, sugar beet is used in low calorie and reduced fat diet. Companies involved in the production of sugar using sugar beet are also using sugar beet by-product known as dried beet pulp which is left when sugar is extracted from the sliced sugar beet. This by-product is being provided in many forms such as molasses dried, pelleted, and plain dried. Manufacturers are supplying this by-product as a livestock feed. Meanwhile, beet molasses is being used for producing chemicals, yeast, and pharmaceuticals. European Food Safety Authority (EFSA) recently cleared genetically modified sugar beet to be used in food, processing, feed imports, and for food containing ingredients produced from it. Although, it has not been authorized for cultivation within the EU. GM sugar beet is also being considered for biofuel production. Meanwhile, regulatory agencies across the world have also concluded that the white sugar whether extracted from conventional sugar beet or from biotech sugar beets is the same, with no difference in nutritional value or composition. 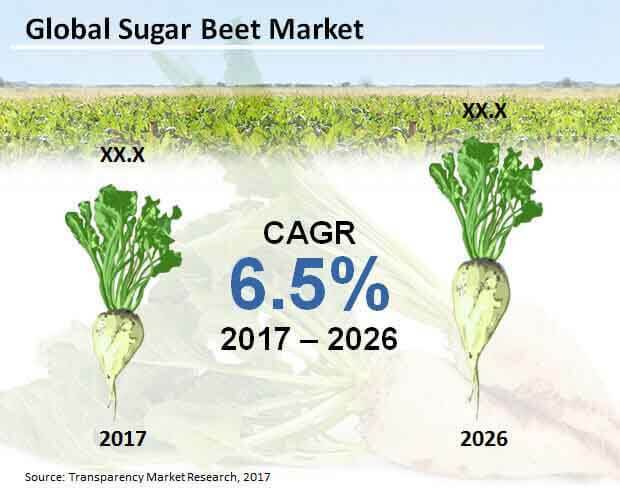 A new study by Transparency Market Research (TMR) projects the global market for sugar beet to witness strong growth. It also projects the market to register 6.5% CAGR during 2017-2026. The market is estimated to reach US$ 50,420.1 million revenue by 2026 end. Among various products made using sugar beet, other end products consisting pressmud, beet pulp, bagasse, and molasses are likely to gain more than half of the revenue share by 2017 end. Meanwhile, raw sugar made using sugar beet is projected to exceed US$ 10,900 million revenue. Sugar beet molasses is being used as a de-icing agent on roads, as it does not corrode. Moreover, sugar beet pulp and molasses are used as a feed for livestock. These by-products from processing sugar beet are also being used in commercial backing, alcohol production and pharmaceuticals. Also, waste lime to increase soil pH levels is being made from sugar beet by-products. Beat processing industry is likely to emerge as the largest user of the sugar beet. By 2026 end, beat processing industry is projected to surpass US$ 21,500 million revenue. Other than the rise in the production of sugar from sugar beet, there has been a rise in the use of by-product obtained by processing sugar beet. Hence, the beet processing industry is accounting for the increasing using sugar beet. Europe is likely to emerge as the largest region in the global market for sugar beet. Most of the sugar beet is cultivated in the northern part of the Europe, due to the favorable climate suitable for growing sugar beet. The countries contributing towards the sugar beet production are France, U.K., Germany, and Poland. Moreover, in order to support the sugar beet production and farmers, nearly eleven EU countries have agreed to provide support sugar beet producers. Meanwhile, North America is also likely to witness growth in the sugar beet production in the coming years. Agrana Zucker Gmbh, Michigan Sugar Company, Amalgamated Sugar Company, LLC, Southern Minnesota Beet Sugar Cooperative, Rana Sugar Ltd, Tereos, Nordic Sugar A/S, Nippon Beet Sugar Manufacturing Co. Ltd., British Sugar Plc, and American Crystal Sugar Company are some of the market players in the global market for sugar beet. Sugar whether produced from sugar beets or sugar cane grown using any method i.e. organic, biotech, or conventional results in the same natural and pure sugar for consumption. Sugar beet is a member of Amaranthaceae family. Sugar beet grows underground and is harvested and processed differently. Sugar beets are eaten raw and even in the cooked form, however, sugar manufacturers are using sugar beet to produce refined sugar, brown sugar and other products such as molasses, pressmud, etc. Sugar beet is being used both as a source of sugar and the plant residue is also being used as a fuel. The by-products that are obtained from processing the beets into sugar (molasses and pulp) are used on a large scale as fiber-rich supplemental feed for livestock. The report on the global sugar beet market offers in-depth analysis of the various factors driving and acting as a restraint in the growth of the market. The report also talks about the trends and opportunities, major technological advancements and competitive landscape. The research also provides a comparative analysis and expected growth of the various market segments by conducting an analysis of the growth during the past period. The report offers information on the major factors playing an important role in the market and also in various key regions. New technologies being used by the manufacturers in processing sugar beet to produce end product is also given in the report. The report offers analysis of the overall sugar beet market taking into account the various factors such as opportunities, drivers, and challenges. SWOT analysis, along with Porter’s five force analysis, and market attractiveness analysis for the global sugar beet market are also provided in the report. Additionally, key developments in the market have also been given in the research report. These developments talk about the series of events that occurred in the past and the events that are likely to take place in the future. The report also offers detail on standards and regulations in various regions on producing end product using sugar beet. Different tools had been used to validate the data and information that are expected to influence the business decision-making process. The global sugar beet market is segmented into the end product and end use industry. On the basis of the end product, the market is segmented into direct use, raw sugar, refined sugar, brown sugar, and other end products (beet pulp, molasses, bagasse, pressmud). On the basis of end use industry, the market is segmented into beet processing industry, transportation fuel, and other end use industries. Region-wise, the global sugar beet market is segmented into Asia Pacific Excluding Japan (APEJ), North America, Europe, Japan, Latin America, and the Middle East and Africa (MEA). The report provides a country-wise analysis for each segment, along with the revenue share and CAGR during 2017-2026. The global sugar beet market report offers in-depth analysis of the companies operating in the market. The key players currently active in the global market for sugar beet are American Crystal Sugar Company, British Sugar Plc., Nippon Beet Sugar Manufacturing Co. Ltd., Nordic Sugar A/S, Tereos, Rana Sugar Ltd, Southern Minnesota Beet Sugar Cooperative, Amalgamated Sugar Company, LLC, Michigan Sugar Company, and Agrana Zucker Gmbh.